The CTD probe spent the night surveying at 2000 metres deep across Mount Dent, stopping every 200 metres to collect water samples for our chemists, Doug and Carla. Once the probe was back on deck, they rushed the samples to their lab and found methane in them, which could be a sign of yet more vents out there. 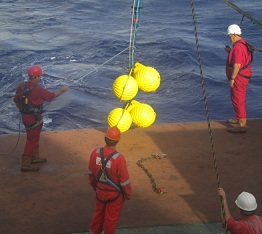 After the CTD probe, we moved the ship to collect the mooring that we put down on the seafloor on April 4th. It was a relief when the sound signals from the ship successfully triggered the mooring's release mechanism, and its orange and yellow floats started to bring it back to the surface. 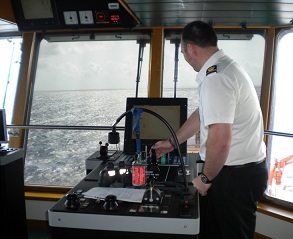 The deck crew handled the challenge of getting the mooring back aboard, led by Chief Petty Officer (Deck) Tiny, co-ordinating with 3rd Officer Nick on the Bridge. Nick manoeuvered the ship carefully towards the floats, avoiding tangling the mooring line in the ship's propellers. The information from the mooring will help our physical oceanographers, Kate and Sarah, to unravel the ocean currents and circulation in the Cayman Trough. They have been studying the physics of the ocean here: its currents, and the temperature and salinity of the water at different depths, from which they can deduce where the water came from, how long it stays in the Trough, and how it moves around down there. The last survey of the area was in the 1960s, so this is the first time the deep water oceanography of the Trough has been studied with modern instruments. As well as improving our knowledge of the ocean circulation in the Caribbean, Kate and Sarah's results will provide insights into general ocean circulation, the distribution of deep-sea life, and how the plumes from vents disperse in the deep ocean. The mooring also brought back Alex's microbiological colonisation experiments. Alex had left a titanium tube on the mooring, filled with different materials - plastic, steel, copper and glass - to see what formed on them. She expects a bio-film to form: this is when bacteria or organisms living in the ocean excrete a solution creating 'slime'. Alex is interested in the level of fouling, or 'slime', appearing on sensors if they are left in the water, and the impact the fouling has on the accuracy of those sensors. The CTD probe was supposed to head out again, but water damage to the cable meant a five hour delay to the launch, while Dave replaced more than 120 metres of cable to fix the problem. Five hours is a long time to lose, so a quick change of plan saw us move four kilometres to launch Autosub6000 on its next mission a little earlier than planned. Over the next 24 hours, Autosub6000 is surveying Mount Dent from top to bottom, which should reveal how the geology of the seafloor changes across it, which should help our geologists figure out how it formed. 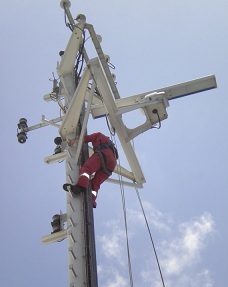 Meanwhile, as part of the ship's general routine maintenace, deck engineer Tom climbed the mast above the Bridge to check out all the communications cables. Finally this evening, we got ready for another HyBIS dive to the vents, which launched just after 10 pm ship's time.